As I write the TV adaptation of Childhood's End is being promoted by the cable channel Syfy (goddam silly name). Given how much I like this book I will probably watch it but before I do I want to reread the source material first, as it’s been decades since I last read it. 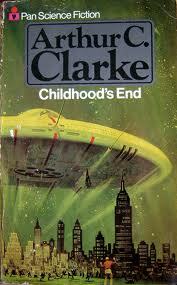 Childhood's End is — to my mind — Clarke's best novel. It is very unusual among his works in term of plot and setting. Most of the book is Earthbound and the story starts in the present day (year not specified). Very little time is spent on the space voyage and the minutiae of spacefaring is not dwelled upon. The opening scene of gigantic spaceships suddenly appearing in Earth's sky, casting massive shadows over cities, has been ripped off by the 1996 movie Independence Day, two versions of “V” TV series*, and probably other media I am not aware of. The movie and TV shows just use Clarke’s vivid imagery but did not do anything particularly creative with it. Another concept “V” may have lifted from Childhood's End is the idea of a seemingly benign alien invasion. V soon switches to the conventional evil reptilian aliens route, whereas Clarke has a far more ambitious tale to tell. At the beginning of Childhood's End the world is on the verge of another world war, with the superpower nations still engaged in an arms race. Suddenly the aliens show up and put a stop to all that and other human destructive tendencies, they also eliminate crime, poverty, hunger, and even cruelty to animals. Then they go on to unite mankind under a literal united nations where different countries and governments are made unnecessary. The sort of thing John Lennon imagined (and no religion too). These are all wonderful things of course, but there is a price for this global utopia. Basically subjugation of the human race in the nicest possible way, the mysterious aliens are even called “Overlords” by the humans. These Overlords also have an ulterior motive for their guardianship of mankind which is not revealed until the last few pages of the book. Clarke’s depiction of the human race before the advent of the aliens gives the impression that Earth is a planet run by children, a little like [b: Lord of the Flies|7624|Lord of the Flies|William Golding|https://d.gr-assets.com/books/1327869409s/7624.jpg|2766512] on a global scale. Left to our own devices, we would eventually self-destruct (looking at the news headlines these days Sir Arthur seems to have the right idea). So whatever the Overlords’ endgame is they are doing us a favor. The human society after a few years under the alien administration reminds me of the post-scarcity society of [a: Iain M. Banks|5807106|Iain M. Banks|https://d.gr-assets.com/authors/1352410520p2/5807106.jpg]’ Culture series, with the same result of ennui and loss of creativity. The time dilation effect of an interstellar voyage is put to good use though. The fate of mankind at the end of the book is mind blowing (I wonder what Clarke was smoking when he wrote this). 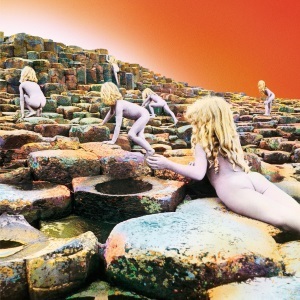 It is so awesome that Led Zeppelin used the imagery from this part of the book for the cover of their album “Houses of the Holy”. I hope Syfy can do a good job adapting this stupendous sci-fi classic, though their past "achievements" don’t inspire much confidence. Regardless, this is one of the few sci-fi books that I would not hesitate to recommend to everybody. If you are going to watch the TV show read this first, I cannot imagine the show improving on the book, but I can imagine it ruining the book all too well. While Childhood's End clearly inspired the aforementioned film and TV shows, I think it may have been — in turn — inspired to some extent by John Wyndham’s [b: The Midwich Cuckoos|161846|The Midwich Cuckoos|John Wyndham|https://d.gr-assets.com/books/1172294996s/161846.jpg|812592] and [b: The Chrysalids|826845|The Chrysalids|John Wyndham|https://d.gr-assets.com/books/1271095852s/826845.jpg|910927]. Syfy's Childhood's End trailer. That hysterical screaming woman already makes me dread what other changes they are going to make. There is no hysteria in the book, well except one guy who screams like a little girl for a moment when he spots something weird in a museum. "And yet, what most intrigues me about Arthur’s work is something else – his ongoing fascination with human destiny – a term seemingly at odds with the scientific worldview. But there is another Arthur C. Clarke. The one who sent David Bowman through the monolith in his great classic, 2001. The author who gave us Childhood’s End. One who frets that we may not be wise enough to survive the next few generations of tense immaturity, let alone become worthy of joining more advanced communities of mind."